Are you searching for bedroom design ideas? If so, XPO Blinds can help! 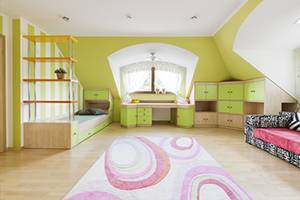 Decorating the kid’s bedrooms is a challenge as they have a lot of ideas, but not all of them might go together and may be to your liking. 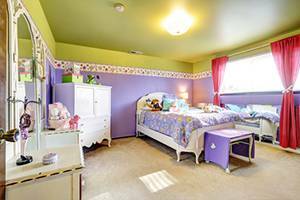 Their new ‘grown-up’ space needs to include their favorite colors and storage for books, games and the rest of their belongings. With this collection of inspirational rooms, you can take an idea and make a cohesive room that blends with the entire home decoration. This breezy aqua color scheme, with white furniture depicting an ocean theme, would suit perfectly a boy. 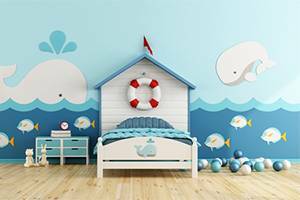 With a beautiful painted wall art featuring whales and fishes adds depth to the predominantly light blue room. The side table includes extra storage with four blue drawers making things look like home. Other adornments include animal sculptures, and balls displayed on the right side of the bed making the room look stylish. A gender-neutral scheme is this blue room with sunny orange touches making it bright and fun. The wooden furniture elements add a tiny dash of sophistication for teenagers and a quirky desk area to help to make study time a little bit more attractive. A palette of bright purple and zingy green make a neat combination of colors when freshened up with white a flower pattern stripe. 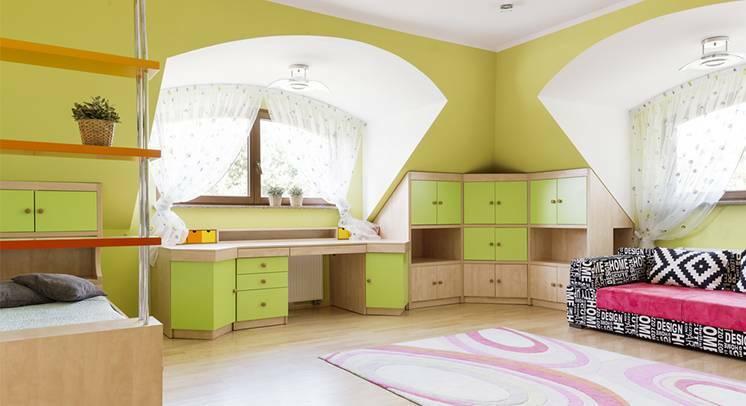 Thi ample room stretches out to a big drawer for hitting books and filing away homework and a mirrored vanity to get ready every morning before going to school. The focal point of this bedroom decoration is the plenty of storage and drawer space under the bed, along with the furniture corner and desk units. 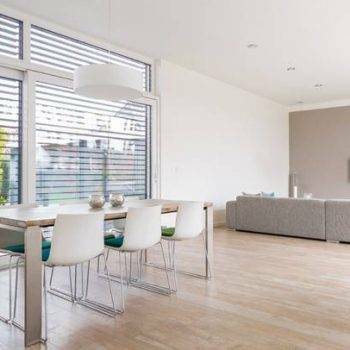 The electric green against the lime green, are attenuated with white stripe accents on the side walls and ceiling, preventing the overall scheme from looking too strident. The second plane of this bedroom includes a subtle pastel rug with off-white colors and circular patterns. Also, a black sofa with white letter fabric and bright pink cushions.